A Historical Site Assessment of St. Andrew’s church was completed in 2012 in preparation for future applications for historical renovation grants. The history of Saint Andrew’s was beautifully completed by Charise Boomsma of the Preservation Studio and is reprinted here with her permission. St. Andrew’s Episcopal Church is located in the heart of Manitou Springs, along the main thoroughfare, Manitou Avenue adjacent to the historic clock tower park. The first early western explorers arrived in 1820 with the Long expedition, and also enjoyed the health benefits of the mineral springs. The notoriety and popularity of the springs continued to grow over the years until General William Palmer (town founder of nearby Colorado Springs) and travel companion Dr. William Bell ventured west in 1868 on a railroad survey. They were intrigued by the possibility of establishing a health resort community centered on the mineral springs. Though the Panic of 1873 is thought to have limited early growth of Palmer and Bell’s resort-style community, by the 1880’s Manitou Springs had a number of major hotels, health spas and summer rental cottages were available to thousands of yearly visitors. The Episcopal community has played an important role in the development of Manitou Springs since 1874, with the first church members holding meetings in a tent with sermons given by Reverend J.F. Walker of Grace Episcopal Church in neighboring Colorado Springs. Early Manitou Springs Episcopalians garnered the support of prestigious community members such and the Bell and Nichols families. Some of the initial Episcopalian worship services were held in the Bell’s personal residence, Briarhurst, when weather prohibited tent meetings. The St. Andrew’s Mission was formally organized in 1877, and in that same year, William Bell donated a lot in the center of Manitou Springs for the erection of the Episcopal church. Fundraising for the building began immediately, though by 1880, the congregants had raised only enough money for the erection of a temporary wooden structure on the site donated by Bell. To allow for the construction of a permanent stone church, in 1884 the original wooden church building was relocated across Canon Avenue, where it stands today. 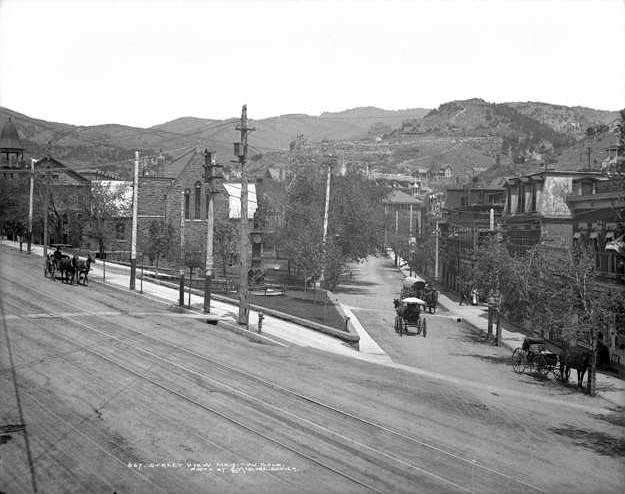 The economic downturn of the 1890’s hindered the economic growth of Manitou Springs, and the $15,000 fundraising effort for the new building was not complete until 1904. The Bell family contributed $6,000 to the construction fund, with the stipulation that the remainder be raised by the congregation. When construction finally began, the cornerstone for the new church was relocated from the original building, then was re-laid for (then Bishop) John Franklin Spaulding on January 10, 1905. 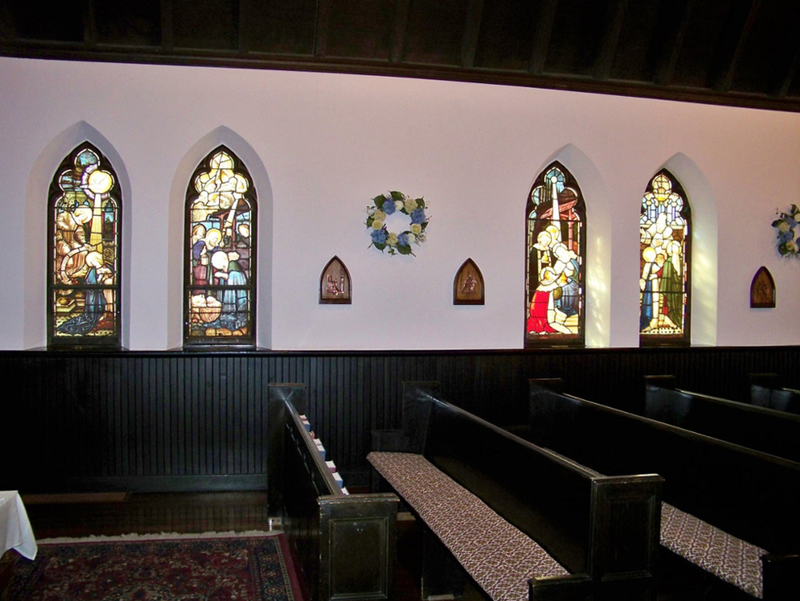 The church has painted glass windows present were ordered from E. Frampton of London, and the saints images in the windows above the altar are the likenesses of John Franklin Spaulding, Mrs. Bell, and Mrs. E.E. Nichols. The Vermont marble altar and baptismal font were gifts of the E.E. Nichols family, with the marble material coming from the quarry that Mrs. Nichol’s father owned. The hand carved Bishop’s Throne was imported from England and is still in use by the clergy. The pipe organ was installed in 1909 by the St. Agnes guild as a tribute to the founding member, Mrs. Ida Nichols Hold, who played the organ and led the choir for many years.